Last offseason, quarterback Peyton Manning worked out at Duke University for the Denver Broncos during his free agency tour before going on to sign a five-year deal with the team. Earlier this offseason, Manning returned to Duke to throw with receivers Demaryius Thomas, Eric Decker, and Wes Welker. Manning's tendency to throw at Duke can be traced to the QB's relationship with Blue Devils coach David Cutcliffe, who was Peyton's offensive coordinator at Tennessee. 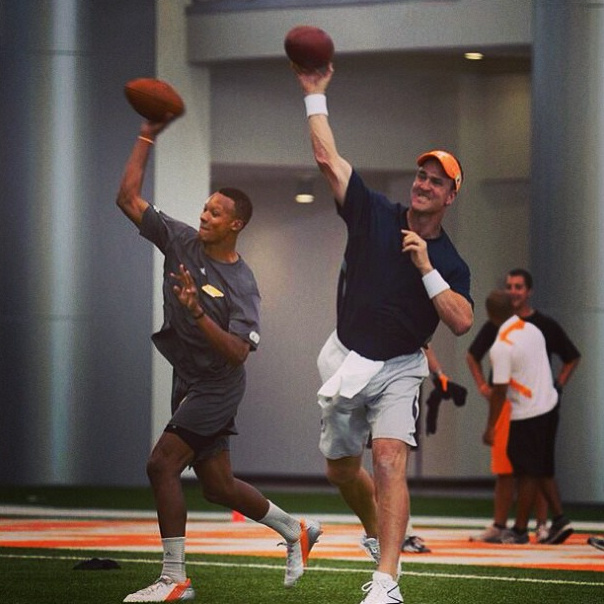 Not overlooking his alma mater, Manning returned to UT on Monday. Manning was in Tennessee for his annual charity golf tournament and stopped by the school afterwards to throw and shoot a commercial for the Pat Summitt Foundation. According to govolsxtra.com, the Peyton Manning Golf Classic benefits the East Tennessee Children’s Hospital and the PeyBack Foundation, which supports at-risk children. That's quite a day for the 37-year old veteran. A charity golf event followed by a passing session followed by a commercial shoot. Just a day in the life of Peyton Manning. 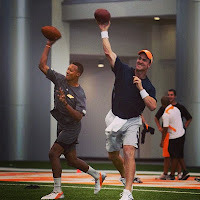 "I’m trying to get my workout in," Manning told govolsextra.com. "(Just) trying to get ready for the season." Manning and his teammates are expected to report back to Dove Valley on July 24. Training camp practice sessions are expected to start the following day, on Thursday, July 25.